For many women, pregnancy brings mixed feelings and emotions. There is the joy of knowing that life has been created and a much longed for baby is growing inside of you, but also apprehension about your changing body shape. It is natural for women to long for their usual physique, lifestyle and energy levels, but there are definitely ways to look and feel great while you are pregnant. #1: The early months of pregnancy can sometimes be the most awkward as you may not yet look pregnant but be noticing that your body is changing shape and your own clothes are not fitting as well as they used to. This is a perfect time to treat yourself to some stylish maternity wear. Even if you do not rush out and buy a wardrobe full of new pieces, some stylish, contemporary, attractive and comfortable pieces of maternity wear really help you to look and feel good. Just as the purchase of new clothes can lift the spirits of a woman who is not pregnant, so too can the purchase of new clothes please a woman who is expecting a baby. And, as maternity wear is becoming ever-more fashionable and stylish (and moving away from the image of frumpy and dowdy), the prospect of shopping for maternity wear is all the more exciting! #2: Many pregnant women are delighted to discover that their fingernails grow much faster and are stronger than they ever were before. Take advantage of this and consider indulging in a manicure or even just maintain your nails well yourself. Treating yourself to some lovely, nourishing hand cream can help to make you feel good too. #3: Don’t be surprised to notice that your hair is suddenly more thick, lustrous and shiny. Your pregnancy hormones prevent you from losing so much hair. Take advantage of your gorgeous tresses and appreciate how great your head of hair looks! #4: The word ‘glowing’ is often used to describe pregnant women and there is a very good reason for this. Again your pregnancy hormones are at play and having a positive effect - more blood is being brought to your skin by way of an increase in your blood volume. Ensure that loads of photographs are taken of you while you are glowing, they are lovely to look back on after the baby is born. #5: While so many of the physical changes of pregnancy also result in you feeling great, there are a number of ways that women can enhance their well-being during pregnancy. Exercise is a great way for a woman to feel great and while vigorous, dangerous or contact sports are rarely advisable, gentle exercise can help a woman manage stress, feel balanced and enjoy this special time of life. Water-based activities, such as swimming and water aerobics are very popular with expectant women. These forms of exercises are gentle and conducive to relaxation and well-being. The buoyancy of the water can also be soothing for women experiencing fatigue and some aches and pains. Maternity swimwear is now available in a range of attractive styles and patterns, so women need not feel that they are required to wear something that resembles their grandmother’s bathing costume. Instead, style and fashion sense can be maintained with contemporary designs and styles of maternity swimwear. If ever there is a time in a woman’s life that she deserves to look and feel great, it is during pregnancy. With maternity fashions now reflecting contemporary trends and styles, women are able to dress in such a way that they look great and feel even better. 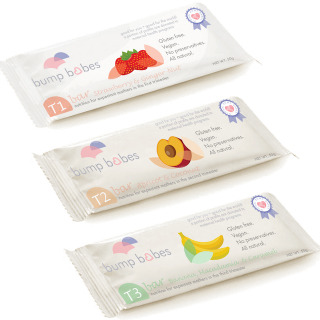 Meet Lesley the founder of Bump Babes pregnancy bars. Pregnancy bars provide a healthy and convenient nutritional boost to pregnant women in the form of a 50g health bar.